Amruthapura is a small village located 67 km from Chikmaglur district of Karnataka. The village is famous for housing a magnificent temple constructed by the Hoysala Dynasty which is the Amrutheshwara Temple. Dedicated to Lord Shiva, this temple was built in 1196 CE by the commander under the rule of King Ballala II, Amrutheshwara Dandanayaka. It is situated close to the Bhadra river reservoir and is beautifully surrounded with coconut and palm trees. Along with the idol of Shiva, that has been brought from the river Gandaki in Nepal, an idol of Sharadha Devi is present on its right. An interesting feature about the Amrutheshwara Temple is that a lamp inside the temple has been burning from the past 200 hundered years!! It consumes almost a litre of oil everyday! 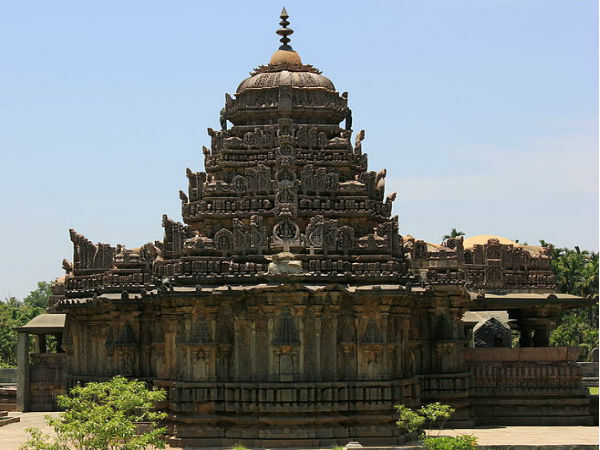 Most of the temples built between the 11th and 14th century around this region, and mainly in Belur and Halebid are contributions by the Hoysala Empire. Artisans of this era had a unique technique of their own, which they followed while constructing all the temples of the time. A temple therefore usually consisted of the following features: Mantapas (halls) with highly detailed carvings of floral designs on the ceiling, intricately designed pillars, exquisite shrines and vimanas (cellas) which are plain on the inside and elaborately designed on the outside. The temple is built in the ekakuta style, i.e, it consists of a single vimana. The closed mantapa is attached to the one that is open, and is an overall medium-sized structure when compared to the other temples of Hoysala such as Veera Narayana Temple of Belavadi. It is believed that a famous sculptor named Ruvari Mallitamma, started his career from this temple. Amrutheshwara temple has number of unique features, that makes it stand out of the other Hoysala structures. One, is the shining pillars that holds up the ceiling of the temple, which happens to be not just an example of Hoysala architecture, but also the influence of Chalukya artistry. The temple also houses a huge stone inscription, which consists of Kannada poetry, reflecting the rich knowledge of the poets of this era. Two, the panels found on the outer part of the teple are not miniatures but comparitively larger panels, with depictions of the epics, Ramanaya and Mahabharatha. Over 140 panels of this sort are found in the temple. Three, the balustrade of the open or outer mantapa, has over a hunder miniatures of temple tower-like structures as a design. Apart from these features, the temple has a total of 29 bays, with 25 of them found inside, while the other four are at the entrance. The temple is open from morning 6 am to evening 6 pm on all days of the week, as well as on public holidays. By Air: The nearest airport to Amruthapura is the Bangalore International Airport, which is located at a distance of 260 km. From here, either a train or bus ride will take you to Amruthapura. By Train: Tarikere has the nearest railway station, which is 11 km away from the temple. Trains from Bangalore to Tarikere are regular, and takes about 4 hours to reach. By Road: KSRTC buses are available to Tarikere from almost anywhere in Karnataka. Or take a bus from Bangalore to Chikmaglur, since buses are quite frequent for this route. Hail an auto or a private vehicle to Amruthapura from here. There are a number of places of interest in a diameter of 100 km from Amruthapura. Kemmangundi is a hill station in Tarikere, located 40 km from the town. It used to be a place of summer retreat for the King Krihnaraja Wodeyar IV of Mysore. Hebbe Falls, Kalhatti Falls, Rock and Rose gardens maintained by the Horticultural Department of Karnataka, are some places to visit nearby. Shimoga, Chikmaglur, Mullayanagiri Hills are some other popular tourist hub that is situated close to Amruthapura.